We stopped into Three Cod Tavern earlier this past summer, while taking a leisurely drive on a rainy Sunday. We hadn’t intended to make this stop, but an online search for a nice lunch brought us to Three Cod Tavern. It was only when we arrived that we realized we’d been before. As was the case during our first visit, the place was hopping with locals. Everybody seemed to know everyone else – from the injured high school athlete who seemed a center of attention, to the older woman who happily informed all with whom she spoke that she “had a bit of a buzz going” (it was about 1:00 p.m.). But the sense was it was a warm place, cherished by the townspeople, and that’s always a good sign. We had to wait quite awhile for our lobster rolls to arrive, and we assumed this was a combination of a busy kitchen and lobster rolls made to order. Luckily their very clam chowder kept us satisfied during the wait. When the rolls finally arrived, they were packed full with fresh knuckles, claws and tail meat, with a reasonable coating of mayo. 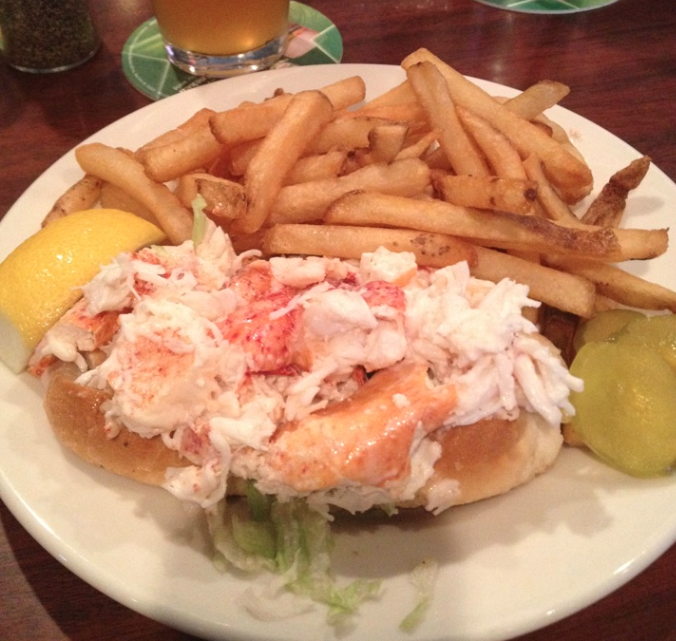 The bun was a standard hotdog roll (not a split-top role), and the lobster was placed on a bed of shredded iceberg lettuce. And so enter one of the few controversies of our quest. One of us really loved this role, and considered it one of the best “cold with mayo” rolls we tried. The other of us was just not all that impressed. There was nothing wrong with the role – it simply didn’t stand out. Since we nearly always agree (within a few points of one another) when rating rolls, this disparity left us puzzled. One of us considered Thee Cod’s lobster roll HIGHLY RECOMMENDED, whilst the other rated it as ACCEPTABLE. But that’s the way the oyster cracker crumbles. 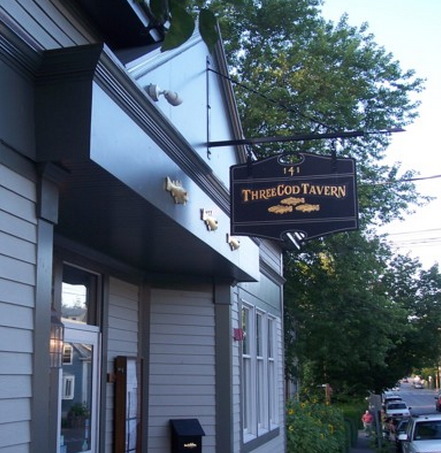 Three Cod Tavern is located at 141 Pleasant Street in Marblehead, MA. WEBSITE: http://www.threecodtavern.com/index.php. FACEBOOK: https://www.facebook.com/threecodtavern?fref=ts. PHONE: 781.639.3263.